Jennifer Lawrence is someone who I think is completely awesome. Not only did her career sky-rocket in 2010 thanks to her gutsy performance in much acclaimed indie Winter's Bone, she is practically now one of Hollywood's most-wanted actresses. And you know, she still seems to be a completely normal girl. Completely normal. Vera Farmiga has slipped off the radar a bit of late, but I sure am looking forward to seeing her directorial debut, Higher Ground. I just love Vera, and I can't really pinpoint on the exact reason why. But she's one cool chick. Anne Hathaway has been my idol ever since I watched Brokeback Mountain back in 2006. She radiates all kinds of happiness it's just ridiculous. Oh, and who remembers that huge Disney princess phase she had back in the day? Yeah...that's a distant memory. 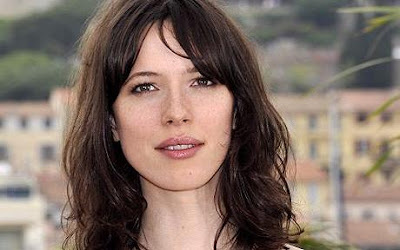 Y'all know that I quite like Rebecca Hall, the rather tall British actress who always seems to be in the right movies. Seriously, I will watch anything that she stars in. Even though she's so amazing that I want to cry. I think I just wish I was Saoirse Ronan. She's one of those rare teenage actresses who has all the talent of an actor who has been in the profession for a few decades. Seriously, if I was an eighth of how awesome she is then I would be such a happy panda. As you're all probably well aware, Amy Adams is my favourite actress, and I think she's an amazing person, too. Sure, there have been some mishaps in her career (ah, Leap Year, anyone?). But she's still one of the bubbliest and most vibrant actresses out there, who continuously shies away from the spotlight. Ever since I watched The Disappearance of Alice Creed, I've been in love with Gemma Arterton. In that movie, I thought she was incredibly gutsy, and she looked so real, unlike any of those other stick-thin actresses. Also, watching Tamara Drewe fuelled my love for her a bit more. Seriously, the girl is amazing! Who doesn't love Natalie Portman? I think she's such a cutie pie, and she seems to have a heart of gold. Plus, her laugh is crazy. Not to mention that she shaved off her hair for a movie role. And learned how to do ballet for a movie role. Dedication. So, do you have any actress idols? I love these people!! Hathaway, Lawrence, Adams, Ronan, Portman and ofcourse Stone are definitely in my list too. God Natalie Portman is the only person in the WORLD who looks good bald. Wow. That's a great group of actresses. I'm a big fan of Lawrence (after just a few movies), Hall, Stone, Farmiga, and Portman. My favorite teenage actress ever is Saoirse Ronan - she's just rocking. And so natural. Great picks, Stevee! Portman is my favourite American actress. The other week I saw Amy Adams in Cruel Intentions 2. It was one of the worst acting performances I had ever seen, but then when I compared it with the stuff she's doing nowadays, it goes to show how amazingly she's progressed. Nikhat - Cool! And yes, Natalie is the only person who looks awesome bald! Dan - Lawrence has taken just a few movies to be awesome! Lime(tte) - Saorise Ronan is just rocking! Tyler - Amy Adams was pretty terrible in the bits I saw of Cruel Intentions 2! But she's made amends since then and now she's just plain awesome! In the modern era there is only one...Meryl Streep. No other actress has come close to her in ability, and her staggering Oscar nominations are testament to that. Kathryn Hepburn may be rated the greatest actress ever but Streep is pushing her damn hard!! I also like Hayley Atwell, and definitely Jennifer lawrence. Her performance in Winter's Bone was well worth the Oscar nomination she received. I hope she does more of those types of roles over those like X-Men. Wait a second... Vera is having her directorial debut? Now she's my idol, too! I so didn't know this. Most of all, I love Meryl Streep, Cate Blanchett and Amy Adams. Brent - Meryl Streep is amazing! I love Jennifer Lawrence...her filmography is looking great at the moment, but I'd love another Winter's Bone from her! Julian - I know you're a big fan of Deborah Ann Woll. She's great! Lesya - Yup, it's called Higher Ground...it came out a few weeks ago in America. I need to see it!